Pixi has a couple new items just in time for holiday gift shopping, and this is my favorite one. 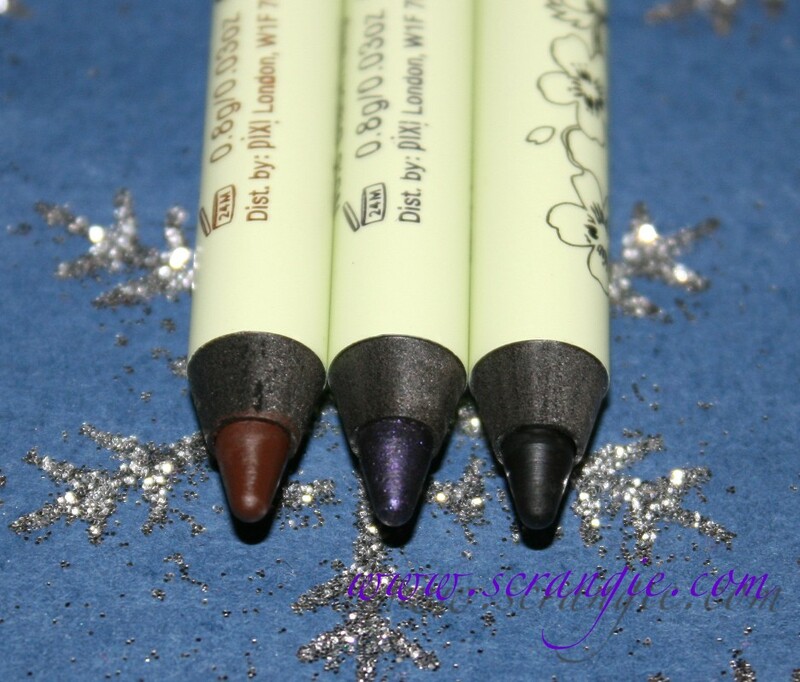 It's called the Pixi Taster Trio Mini Eyeliner Set and it contains three mini sizes of their Endless Silky Eye Pen (which is a pencil, go figure) in Black Noir, Black Tulip and Black Cocoa. The pencils are 0.03oz. A full size Endless Silky Eye Pen is 0.04oz ($14) so you're getting some pretty generously sized 'mini' pencils in this kit. Pixi Endless Silky Eye Pen in Black Cocoa, Black Tulip and Black Noir. No.1 Black Noir, No.3 Black Tulip and No.4 Black Cocoa. The formula on these is extremely soft. It glides on very easily with no tugging. It's much softer and smoother than an Urban Decay 24/7 pencil, and somewhat similar to a Milani Liquif'Eye pencil. 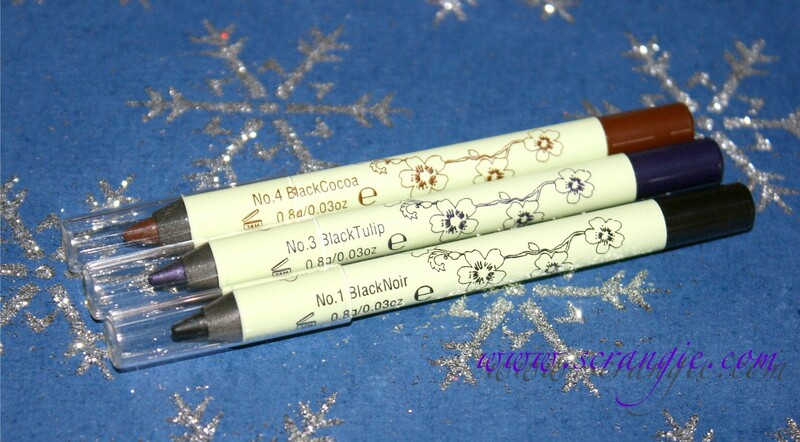 The pencils are super smooth and creamy so they apply beautifully. The formula of the minis is the same as the full sized product, no watered down quality. Perfect color selection for me. Nice and dark with a little hint of color. Only wish it had the Black Blue pencil in it, too. Very big for a 'mini' product, it's nearly full size. 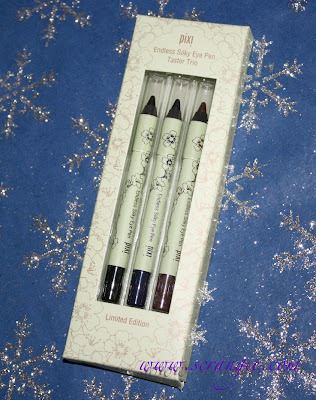 The set is a great value; it's $12 and contains three 3/4 size pencils. One full size is $14. The brown and purple shades actually look like blackened brown and purple on the eye, not just plain black. They're available at Target so you can find them locally instead of online only. They're called pens, but they are actually pencils that need to be sharpened, not liquids or self sharpening (twist up) style liners. That's not a bad thing, but it is strange to call them that. The pencils are so soft that the tips break easily (especially when sharpening) and wear down quickly. I could probably finish one of these in two weeks. They're very soft and smudgy, almost oily feeling, so if you usually have a problem with your eyeliner melting, smudging or migrating, these might not work for you. They're long wearing but don't seem to be waterproof or smudge-proof. They work well for me on the waterline but tend to migrate/melt out onto my lower lashline after a while. Despite how fragile they are, I like the Pixi Endless Silky Eye Pen liners and I'm glad they did this set. It's a super cheap way to try out the colors and formula. The formula is much softer and meltier than I'm used to, but the pigmentation is great, application feels smooth and tug-free and the colors work for me. I'll probably buy a backup of this set for when I eventually finish these minis since it's so much cheaper than buying the full sized pencils individually. 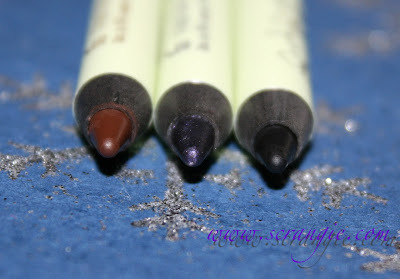 If you're curious about the Pixi eyeliners, this is definitely the best way to try them. Now all they need to do is make a mini set with all the Endless shades, that would be perfect. This set is available at Target or on Pixi's website, $12 for three 0.03oz pencils. I'm so excited to try these, the purple looks amazing. I'm going to ask the bf for them for Christmas, though, so I'll have to hold my ponies for a while. I love your reviews! My favorite part about your reviews are the 'What I liked' and 'What I Didn't Like.' I can't wait for any other items you have to review! Always love your reviews. They really help me to decide whether I want to buy a product. Thanks. Thanks for the review! I always eye this brand when I'm in target, but never knew if it was good or not, and always forgot to look up reviews once I got home... I'll have to pick up this set for sure! Seems like an awesome starting point! Cassykins, haha! I hope you like them, they're the best thing I've tried from Pixi so far. I Drink Nail Polish, I'm so happy that my review was helpful! Unknown and Lucy, thank you both so much. That makes me happy and I'm really glad you commented. Absolut Law, you're welcome! 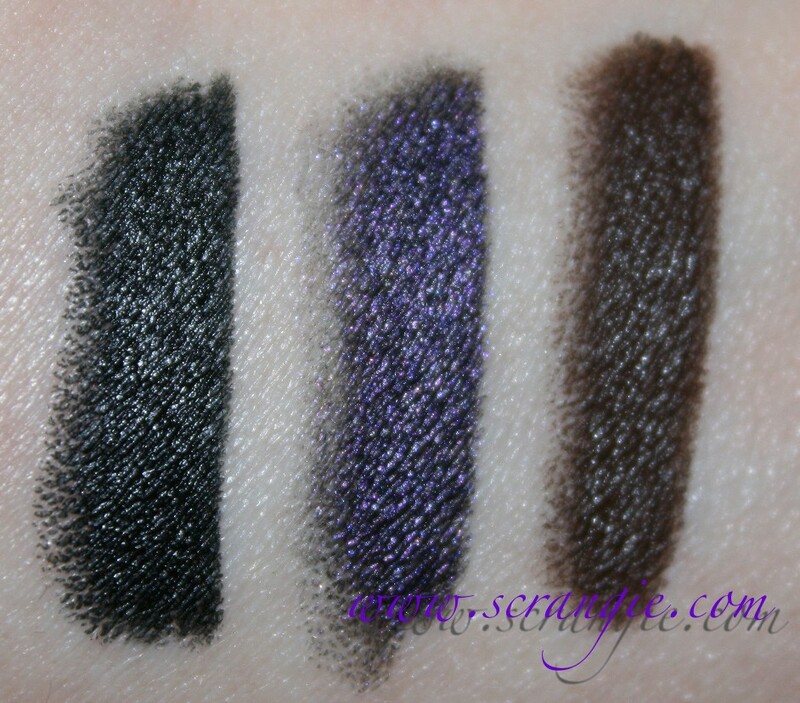 The shadows are firmly mediocre, the blush is fairly decent, but the eyeliners are the only great thing I've tried from them. Super creamy! Victoria, they're so soft, I bet that would work. But they're really dark! 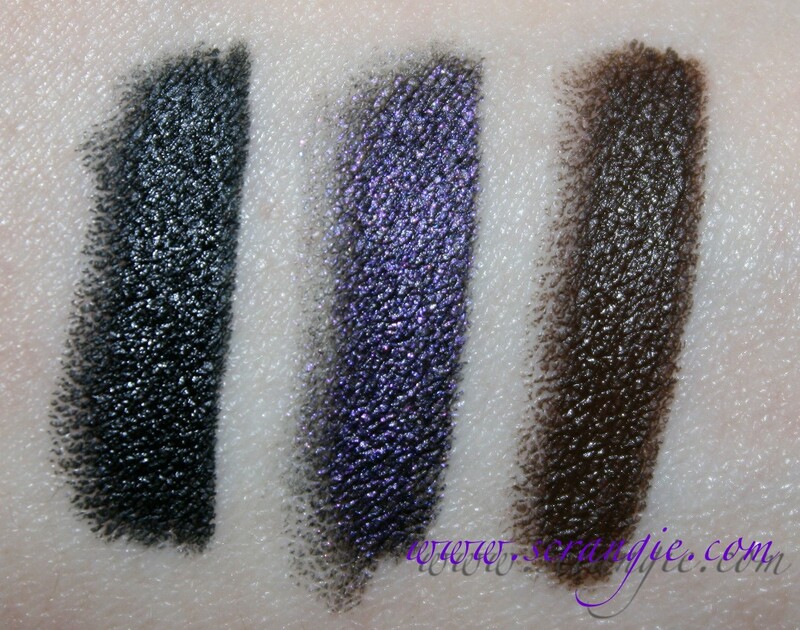 I'm very impressed with the pigmentation on these in your swatches! Darn you, Scrangie, darn you a lot! Look, I had to go to Target to pick up a prescription right after I read this post. The Pixi section is right in front of the pharmacy! Ooh, these are nice! I don't wear eye pencil on my eyes (powder works better for me), but I do a lot of FX and theatre make up - these pencils work great for me! I tested one in Target when I was working at a salon, and then I washed and blow dried a client's hair - the line on my hand was still clear and dark, so I went back and bought some. I love how soft they are, it makes it easy to get a dark line.